DESTREOS - Makes it win 101! Amazingly it was start 465 and win number 101, achieved by the grand old warhorse Destreos, at Hobart last Friday, the 22nd March. It has been sometime between drinks, as they say, as Destreos’ last, and 100th win, was 11 months ago, back on the 20th April 2018. That was as an upset winner, paying $25.50, despite the fact that he had won just five starts prior as a $1.80 hot favourite, but he won with authority, by a massive 11.4 metre margin, in a 1:57.8 Mile Rate for 2090m. The now spritely 15-year-old has incredible overall career statistics of 465 starts, for 101 wins, 72 seconds and 65 thirds, for total stake earnings of $824,034. 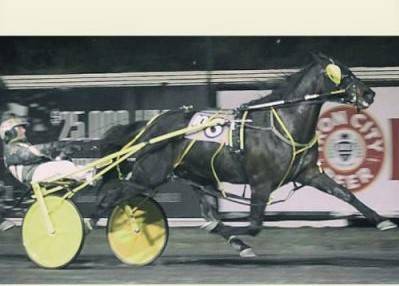 His fastest mile time is 1:51.9, run when winning at Albion Park over 1660m on the 17th November 2015 as a 12-year-old. Destreos is by Astreos, a moderately successful Artsplace stallion, out of Melvin’s Speed, a 6-win Melvin’s Strike mare, so he certainly wasn’t fashionably bred. He was indeed bred by the Estate of BT Grice and was initially educated in New Zealand by close family member Steve Phillips before he handed the horse over to trainer Geoff Small. Geoff qualified Destreos at Alexandra Park, in Auckland on the 10th January 2006 as a 2-year-old, where he finished 6th of 8 runners in a Mile Rate of 2:05.1 over 1700m and interestingly the qualifier one spot ahead of him was another Geoff Small trained runner in Changeover, who went on to have 29 wins for $2,426,765 and a best time of 1:53.4 and is now a successful sire standing in Queensland. Destreos started his race career at Alexandra Park, on the 27th January 2006, where he finished a creditable 2nd placing to Gotta Go Cullen, who went on to have 24 wins for $1,173,343 and also have some success as a sire. It only took Destreos four starts before he won his first race, once again at Alexandra Park, on the 31st March 2006. He then went on to win his very next start at Cambridge and fashioned a good record in New Zealand of 50 starts for 7 wins and 18 placings for $59,208 in stakes, before he was exported to Australia in July 2008 as a 4-year-old. Steve Phillips resumed the training duties with Destreos as a 3-year-old and continued to train him for the remainder of his time in New Zealand, other than a brief spell of 5-starts for Michelle Wallis during his late 3-year-old season. 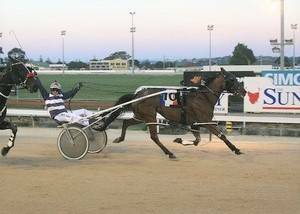 During his career Destreos has raced at Alexandra Park, Cambridge Raceway, Redcliffe, Gold Coast, Albion Park, Dubbo, Newcastle, Menangle, Bathurst, Launceston, Hobart, Carrick and Devonport, so he has certainly covered some miles off the track as well. achieved both his 100th and 101st wins. Kelli Dawson is well ahead with total wins, having 57 victories, with 54 of those being at Albion Park. Now based in Tasmania, Destreos notched up win No.99 at Launceston on the 12th January 2018, but had been stranded on that mark for more than three months, with his endeavours to reach the milestone stalled when he was stood down from racing by stewards after an irregular swab to an unacceptably high cobalt reading. He was then given the all-clear to race, reaching the 100-win mark in his 450th start at Devonport in Tasmania. Destreos’ form had been ordinary by his standards leading into this race, with four unplaced starts since his 99th win, the old pacer sat parked to beat the Victorian visitor Stagger Lee in a 1:57.7 Mile Rate for 1930m, just 0.2 seconds outside the track record. In winning and achieving his 100th victory, Destreos became only the third horse in Australasia and indeed the Southern Hemisphere to reach the milestone, with Paleface Adios (108) and Cane Smoke (120) realizing the achievement before him. Interestingly, in North America, the list of centurions has grown to 17, including the world’s richest pacer of all time Foiled Again (109 wins, $7,635,588, 1:48.0 from 331 starts). Other than a 19-start stint in 2011/12, when he was trained by Cristina Monte, Ken Rattray has trained the warrior throughout his Australian career, until partner Sally Stingel, also the owner, took over the training duties this season, for the much-loved family member of the team. While Destreos’ biggest victory was only in the 2012 Group 3 $30,000 Be Good Johnny Sprint, at Albion Park, his accomplishments in Queensland harness racing were recognised in 2017, when he was inducted into the state’s Hall Of Fame while still racing. Destreos has been dubbed harness racing’s modern-day Iron Man, as well as being given the nickname of “King of the Creek” because of his amazing record at the home of harness racing in Queensland, Albion Park, where he raced on 321 occasions for 73 wins (the unbeatable record at the track) and 100 placings. What a true grand old warrior, Destreos … we salute you !! !